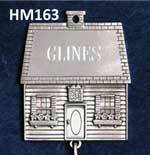 Did you know that high quality pewter complements virtually any color and material? This makes personalized pewter home decorations perfectly suited for adding grace and luxury to any room in your home. 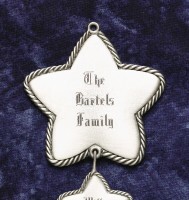 Custom engraved pewter decorations also make for elegant housewarming gifts. 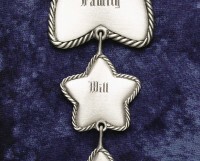 Take a look at our fine selection of personalized pewter home decorations and gifts, and choose a custom engraving that speaks from the heart. 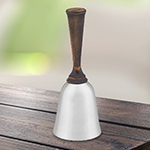 Pewter bells are a beautiful addtion to your home or as a gift for someone else. Great additions to your desk or den. From pencil holders to wall hooks, our pewter items will add a touch of class. 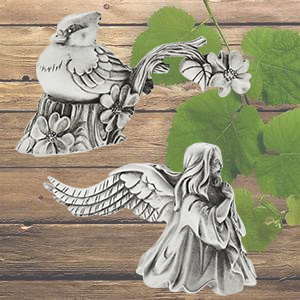 These pewter figurines have been designed for you with meticulous detail. Start collecting today. Solid pewter hooks with mounting hardware included. pefect for hanging a variety of different items, keys, jewelry, leashes, and more. Brighten every room or some one's day with a classic, handcrafted pewter vase. We have a variety of sizes that is just the right size for the arrangement your are creating. Cute and useful items to accessorize the kitchen. These pewter magnets, cake testers & candle holders are all created in our USA workshop. These sturdy, safe and easy to use lamps will remind you of our forefathers. These pewter lamps are not only beautiful to any home decor, but are also functional. Candle snuffers make beautiful accessories to an elegant setting. We have many popular themed designs, lighthouse, cardinal, hummingbird, pineapple, garden watering can, are some of our most popular. Call us at 866-282-7384 with your questions.